"In October 1838, that is, fifteen months after I had begun my systematic enquiry, I happened to read for amusement 'Malthus on Population,' and being well prepared to appreciate the struggle for existence which everywhere goes on from long-continued observation of the habits of animals and plants, it at once struck me that under these circumstances favourable variations would tend to be preserved, and unfavourable ones to be destroyed. The result of this would be the formation of new species." "The solution, as I believe, is that the modified offspring of all dominant and increasing forms tend to become adapted to many and highly diversified places in the economy of nature." "This shows how necessary it is that any new view should be explained at considerable length in order to arouse public attention." "Though considerably added to and corrected in the later editions, it has remained substantially the same book....It is no doubt the chief work of my life." "It has sometimes been said that the success of the 'Origin' proved "that the subject was in the air," or "that men's minds were prepared for it." I do not think that this is strictly true, for I occasionally sounded not a few naturalists, and never happened to come across a single one who seemed to doubt about the permanence of species." Darwin was most elaborating and saw deeply, but actually, there were ideas floating around, as Wallace (but also others, too) proves. This undoubtedly affects ideas we think about today, too, but we can find our like-thinking contemporaries--or predecessors--by web-searching (if we want to). "Another element in the success of the book was its moderate size; and this I owe to the appearance of Mr. Wallace's essay; had I published on the scale in which I began to write in 1856, the book would have been four or five times as large as the 'Origin,' and very few would have had the patience to read it. I cared very little whether men attributed most originality to me or Wallace; and his essay no doubt aided in the reception of the theory." Darwin, ever the generous man. But his societal advantages guaranteed his preeminence, and he was more thorough. Wallace's ideas were more group- than individual-oriented, and may have some merit although Darwinites take pleasure in scorning them. And nobody can refer to most of Darwin's books as other than quite long! "Hardly any point gave me so much satisfaction when I was at work on the 'Origin,' as the explanation of the wide difference in many classes between the embryo and the adult animal, and of the close resemblance of the embryos within the same class. No notice of this point was taken, as far as I remember, in the early reviews of the 'Origin,' and I recollect expressing my surprise on this head in a letter to Asa Gray. Darwin relied on embryological data and ideas from his predecessors, particularly von Baer in Germany. Darwin is right about his idea of Pangenesis (the idea that each part of the body emits particles that he called 'gemmules' that congregate in the gonads and contribute to the gametes) being of 'little or no value', and indeed it was very much like the Lamarckian view he sneered at. But what is the role for free speculation in science? Darwin's speculating was pretty clear, since there was no data supporting 'gemmules' or 'pangenesis'. Yet, as long as they are clearly marked as guessing, can intelligent guessing stimulate creative thought? Is it better, or worse, than just saying "we have no idea how this works...."? "In July I opened my first note-book for facts in relation to the Origin of Species, about which I had long reflected, and never ceased working for the next twenty years." Again, evidence of such patience! And the result shows why one need not, perhaps should not, rush to publish. (By Charles Lyell, the distinguished senior geologist and close Darwin friend): ""What a good thing it would be if every scientific man was to die when sixty years old, as afterwards he would be sure to oppose all new doctrines." But he hoped that now he might be allowed to live." "Our fixing ourselves here has answered admirably in one way, which we did not anticipate, namely, by being very convenient for frequent visits from our children." Keeping priorities about what means most in life. "I have therefore nothing to record during the rest of my life, except the publication of my several books." "Nevertheless, I doubt whether the work was worth the consumption of so much time." "It was evident that such facts as these, as well as many others, could only be explained on the supposition that species gradually become modified; and the subject haunted me. But it was equally evident that neither the action of the surrounding conditions, nor the will of the organisms (especially in the case of plants) could account for the innumerable cases in which organisms of every kind are beautifully adapted to their habits of life— for instance, a woodpecker or a tree-frog to climb trees, or a seed for dispersal by hooks or plumes. I had always been much struck by such adaptations, and until these could be explained it seemed to me almost useless to endeavour to prove by indirect evidence that species have been modified. I worked on true Baconian principles, and without any theory collected facts on a wholesale scale, more especially with respect to domesticated productions." Darwin the observer, not the rusher to conclusions! "I soon perceived that selection was the keystone of man's success in making useful races of animals and plants. But how selection could be applied to organisms living in a state of nature remained for some time a mystery to me." Yes, agriculture has done it--changed species' traits--but how does it happen in Nature? I have just been re-reading Charles Darwin's autobiography. He wrote it with his son's encouragement shortly before the great man passed away in 1882, and was first published in 1887. I think he wrote it to tell his children and so on about his famous life. Yet as famous as he had become, he is as modest as one would expect from that exemplar of the best of humanity. I encourage anyone in the life sciences, who doesn't presume to think s/he already knows everything, to read it, for reasons I'll suggest below. It has various versions, as his son Francis edited it a bit, redacting some personal family-related comments (these were later restored, but are unimportant here). You can find it here. "To my deep mortification my father once said to me, "You care for nothing but shooting, dogs, and rat-catching, and you will be a disgrace to yourself and all your family." "Looking back as well as I can at my character during my school life, the only qualities which at this period promised well for the future, were, that I had strong and diversified tastes, much zeal for whatever interested me, and a keen pleasure in understanding any complex subject or thing. I mention this because later in life I wholly lost, to my great regret, all pleasure from poetry of any kind, including Shakespeare." Darwin more than once admitted, or even bemoaned, his narrow focus and neglect of some of the finer things in life. Yes, he was successful, but this could be a lesson for us all: keep a balance! "I almost made up my mind to begin collecting all the insects which I could find dead, for on consulting my sister I concluded that it was not right to kill insects for the sake of making a collection." Even Darwin saw the evil in killing other living things just to gawk at them. We do it routinely, even including mammals (mice, etc. ), but to salve our conscience (for those who have one) we get IRB approval first, to keep their suffering under at least some constraint and prevent our suffering from lack of a project to do. "This was the best part of my education at school, for it showed me practically the meaning of experimental science." He observed rather than simply conjectured, and his patience and eye for detail and for identifying the critical variables were at the root of his success. "...but to my mind there are no advantages and many disadvantages in lectures compared with reading." Ooops, professors! Some of us do need to hear a message live and have it explained. Darwin, though, had the drive, and patience, to study a subject in great detail. How many of us have that? "At this time I admired greatly the 'Zoonomia;' but on reading it a second time after an interval of ten or fifteen years, I was much disappointed; the proportion of speculation being so large to the facts given. ....in after years I have deeply regretted that I did not proceed far enough at least to understand something of the great leading principles of mathematics, for men thus endowed seem to have an extra sense." He reasoned in his own way, and did't really suffer by his non-numerical abilities. Maybe he was not misled by math's oversimplification and rigidity? Maybe we rely far too much on the latter, as a safer and quicker course to 'results', than patient, deeper thinking? "During my last year at Cambridge, I read with care and profound interest Humboldt's 'Personal Narrative'." "...science consists in grouping facts so that general laws or conclusions may be drawn from them." If he was anything, it was a patient, careful sponge for detail. And reading stimulated his original thinking. "I heard that I had run a very narrow risk of being rejected, on account of the shape of my nose! He was an ardent disciple of Lavater, and was convinced that he could judge of a man's character by the outline of his features; and he doubted whether any one with my nose could possess sufficient energy and determination for the voyage." Here he's talking about having almost been rejected for the voyage that became the basis of his life's work by Fitzroy, the captain of the Beagle. Beware of hoaxes even in science! We see unwarranted speculative conclusions being asserted almost every week in the news media, and even in journals (though there, couched in dense professorialized terms!). "The investigation of the geology of all the places visited was far more important, as reasoning here comes into play." "Everything about which I thought or read was made to bear directly on what I had seen or was likely to see; and this habit of mind was continued during the five years of the voyage." Again, his integrative detail-sponging patience and reasoning. No rush to conclusions (or to print). Indeed, he waited for 25 years before publishing his ideas on evolution, and only did so then when he was prompted by Alfred Russel Wallace's discovery of the same ideas. "The sight of a naked savage in his native land is an event which an never be forgotten." "Nor must I pass over the discovery of the singular relations of the animals and plants inhabiting the several islands of the Galapagos archipelago, and of all of them to the inhabitants of South America." We know how important that set of observations was! The islands are still under close observation. "But I was also ambitious to take a fair place among scientific men,— whether more ambitious or less so than most of my fellow-workers, I can form no opinion." "...I am sure that I have never turned one inch out of my course to gain fame." Ambition, yes--but egotism and show-boating, never: no rushing to the news media, no spin doctors! Strangely, we seem to be in the midst of a cataract epidemic! It seems that everyone I know is having to have their lenses replaced, and I have been experiencing glare and other issues that suggest the same may be looming for me. It is the personal experience that drew my attention to this epidemic. That is, I have seen no stories about this in Science or the public news media. That is very strange, since they seem to seize upon any even marginally interesting story. Yet this epidemic has not hit the headlines, at least not yet. (1) Is it food? With processed and GMO animal and plant foods increasing their prevalence, widely and recently, as well as pollution of the seas from which seafoods come, an obvious suspect would be dietary. Junk foods and other such habits could have effects that are subtle but accumulate, with delayed-onset vision consequences. Dietary factors clearly are, after all, responsible for many 'modern' diseases. (2) Is it viral or infectious? So many of us move around the country and, indeed, the world that any virus arising even in a remote part of the globe can rapidly spread. Air transport from tropical to temperate zones would be a major suspect, as would international transport of goods and so on. But what virus or infectious agent might be involved is unclear, nor do we know where a similar epidemic might be occurring, unreported. (3) Is it recent environmental contamination, in air or water? It is impossible to ignore global air and water pollution as potential cataract causing factors--even if the mechanism itself is not known. After all, has it even been examined, given that the epidemic hasn't yet really been recognized? Air and water currents circulate widely around the world, which could make the causal source of the epidemic very distant from the consequences. It might not even be suspected. After all, the lens is a very special kind of tissue and a connection may be very strange relative to what the usual exposure-consequence studies look for, not to mention the statistical methods used which could be quite inapt. (4) Or, being very cynical, could it be marketing or profiteering by the companies that make the gear and supplies that are involved? In that case, perhaps the idea that there is a real epidemic may be mistake--we would just be being told that there was. This subjective, cultural sort of factor would be vary difficult to document. After all, gear-makers do need to make sales of their gear. Overall, I am stunned at what seems to me to be an obvious but almost wholly unreported yet major epidemic that seriously threatens quality of life. As I must acknowledge in what is a speculative blog post, the whole story could be my ignorance of the literature. I am a geneticist, but I have seen no reason to think this could be genetic, since our population's genotypes have not changed in any substantial way in the recent decade or so. But if not genetics, then what? One must at least ask that question! Yet, strangely I think, the professional epidemiological literature seems to have ignored or even been unaware of the major epidemic, which from my point of view seems clear to me; such neglect is very hard to understand, since (again, to be rather cynical) epidemiologists are naturally eager for any Big Problem they can find to justify Big Studies. This blog site is usually about genetic causation and its associated scientific issues, but once the question of the seeming neglect of a cataract epidemic struck me, I decided I should at least use Mermaid's Tale to air it. I would welcome any comments that raised original or even partly plausible explanations. However, and finally, I must end by acknowledging that I have done no rigorous study of the cataract problem. Indeed, at my age, I should long ago have learned to avoid the temptation to talk to so many of my peers about it. It could frighten them. Before suggesting that it is a major epidemic, I should think about who I'm talking to. Luigi Luca Cavalli-Sforza has died, at age 96. Who? I wonder how many readers of this blog, or in general how many anthropologists or human geneticists of less than middle-age, know who he was. We are not, these days, in the habit of crediting the past. But Luca, at least, is worth remembering--for those who remember him. Born in Italy, Luca received his MD there and then, when WWII ended, studied population genetics with RA Fisher in England. He spent most of his career at Stanford, where he taught and did his creatively integrative and theoretical work on human variation and its evolution. He collaborated with many colleagues from around the world. He was, from my graduate-student years on, probably the leading human population geneticist in the world. He developed numerical methods for analyzing human allele-frequency variation and relating the pattern of that variation to global population history, relating that variation to other kinds of data. In particular, he was interested in the relationship of language patterns to genetics, and the causal relationship between cultural dynamics--such as the spread of agriculture--and genetic diversity, and he developed ways to analyze how the latter could be used to help reconstruct the former. I was incredibly fortunate to have been able to spend a sabbatical in Luca's lab at Stanford, in the late '70s. I had no particular 'project' to work on but, typically for him, he hosted me anyway. It was enough for me to know that he and his associates were leaders in human population genetics, as a science per se, but also that they were so original and creative in relating genetic variation to cultural, language, and technological history. His was a synthetic view. He was technically original and advanced, but based on innovative and integrative thinking. Luca wrote much, but his two most memorable and durable books, that encapsulated much or most of his interests are (1) The Genetics of Human Populations, with co-author Walter Bodmer (W. Freeman, 1970; and a subsequent watered-down version with author order reversed), and (2) the massive History and Geography of Human Genes, with P. Menozzi and A. Piazza (Princeton Press, 1994). Both are still available, I think, the former in a Dover reprint. 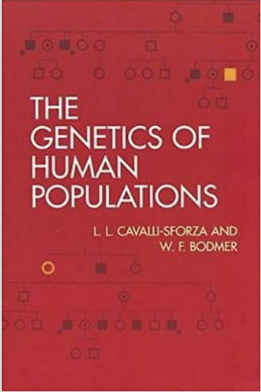 The Genetics of Human Populations was a digestible, but sophisticated version of population genetics theory and method, suitable for understanding human origins, allele frequency variation, and evolution. Many anthropologists and others learned their trade from this book. The second book was the final word on traditional allele-frequency (rather than DNA sequence) based reconstructions of human global variation. Luca worked on topics too numerous to go over here. But this is very well described by John Hawks' fine summary of Luca's work and Wikipedia: Luigi Luca Cavalli-Sforza provides references. For anyone even remotely interested in the history of anthropological genetics and its contribution to human evolution and culture history, it will be worth the effort to be familiar with these foundational contributions. 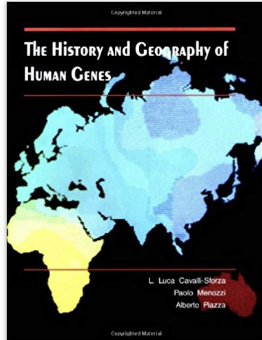 Luca was a central figure in the attempt to organize a worldwide, systematic sampling of human variation (called the Human Genome Diversity Project, or HGDP). That project never took place as such, because, economically it came into funding conflict with the Human Genome Project, to generate a sequence of a representative complete human genome, and, politically because scurrilous accusations were leveled against the HGDP by those who saw it as a project to categorize people exploitively, much as racism does; this was grotesquely false and opportunistically culpable on the part of jealous or ignorant critics and scandal-thirsty journalists. However, the stir provided NIH with a safe excuse not to fund the HGDP. Instead of a formal, globally systematic project, Luca used the heterogeneous blood-group and protein variation data already collected over many years by various investigators around the world, to show global patterns of human gene frequencies. His tome (#2 above) presented these data, much of which are still available. Luca and colleagues developed methods for analyzing the pattern in relation to historical or prehistorical (assumed) human demographic behavior. As science history often goes, this approach was soon to be pre-empted by DNA sequencing technology, and individual genome sequences supplanted protein and antibody-based allele-frequencies as the primary data for studying human variation and evolution (Ken Kidd at Yale, and a lifelong colleague of Luca's and an organizer of the HGDP effort, has maintained a very useful site for allele frequency and other data). In this sense, historically, Luca's Big Volume was the last word on the earlier technology. But of course similar attempts to reconstruct not just history itself but to integrate that with other aspects of human existence--are actively being pursued by many people, and this can now be extended far back in time thanks to the ability to extract DNA from fossils. Nonetheless, in terms of the history of anatomically modern humans, the basic outlines in Luca et al. 's book, based on sample allele frequencies, I think still generally hold. I'm not sure how long Luca will be remembered. What I write here is a paean to a wonderful person and terrific scientist. But there is no single 'discovery' nor Cavalli-Sforza 'theorem' or the like, that will be, by being named for him, his lasting legacy. He was not a grandstander, didn't play to the media, and his students and colleagues are now very senior. The present formula in science has little interest in crediting the past (it's not good for careerism), and that generally also often means not reading its lore, either. As happens in science, on technology supplants prior ones, and DNA sequence and other 'Big Data' and 'omics clearly and rightly have co-opted the less informative data types of Luca's era. In some sense this does vitiate earlier methods as well as data. The new data have also enabled publication that is very technical, but in part for the public glamor of technology is less closely tied to deeper, integrative, thought. Nor was Luca the first to use population genetic data to look at human local or global history--studies of blood group variation, for example, well antedate his work, even if generally more crude in method and detail. In that sense, Luca helped set the stage, but his timing was all wrong. Ah, well. Had he been starting now, with the technologies and database resources currently available, and the much more direct data of DNA sequence (and other 'omics), rather than allele frequencies from population samples, he would have made perhaps a more durable mark, and I suggest that he would have done so more deeply than was possible from the earlier data to which history limited his attention, and not in the hasty rush to print that is now so prevalent. I fear these may be the hard realities of history. But thoughtfulness, intelligence and, not least, personal grace only come along sporadically. Cavalli was a gem of his time.